The Naena Waterfall is one of the most pleasant waterfalling experiences in Japan. 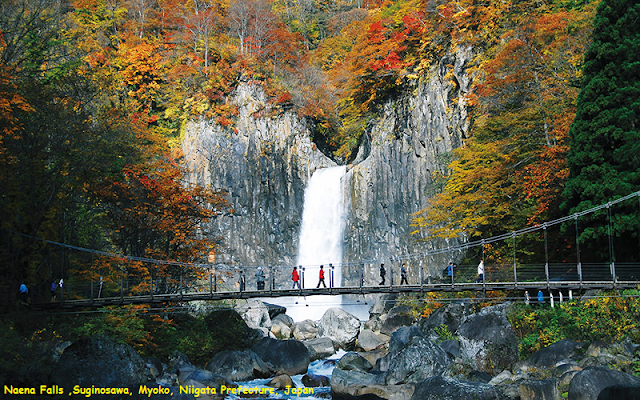 As you can see from the photo at the top of this page, you happened to have timed your visit for the near peak of the koyo (or Autumn colors), and it complemented quite well this classically-shaped rectangular 55m tall waterfall flanked by pronounced basalt columns. The Naena Falls was not only one of Japan's Top 100 Waterfalls according to the Japanese Ministry of the Environment, but it was also very popular as we shared this falls with dozens (maybe well over a hundred) people mostly from tour buses.